The novelty factor has definitely played a part in their popularity with couples trying to outdo the other with the most original wedding. However, they can be very practical. 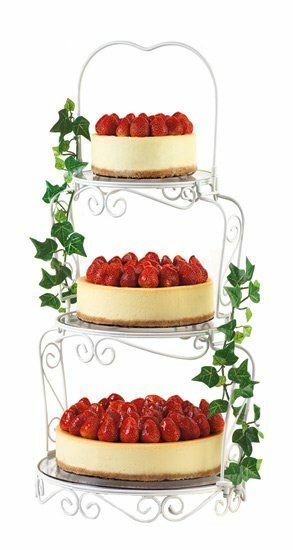 For starters, a cheese cake works out significantly cheaper per head than many decent caterers will charge for a cheese course. 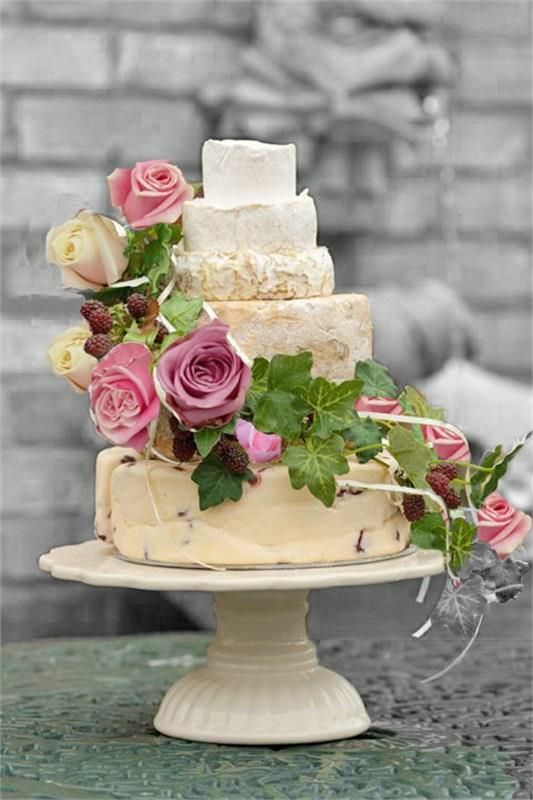 Also, traditional and elaborate fruit or sponge cakes just aren't to many people's tastes, cake often goes uneaten as well after people have indulged their sweet tooth with the desert course, whereas cheese has endless nibble appeal, especially after a few drinks! 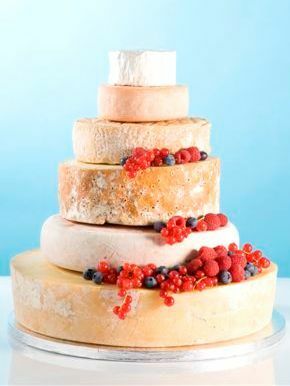 Before choosing a cheese wedding cake, make sure you go and have a look at some in a local cheese shop. Taste different cheeses and discuss ideas with the expert Cheesemongers. 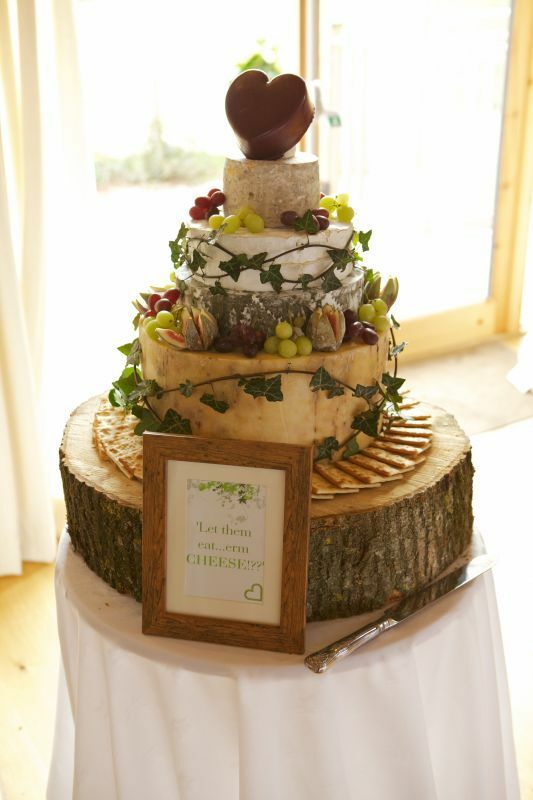 While you may choose whichever cheese you like, there a few simple rules when it comes to putting a cake together. The most important being that soft cheese should never, ever be the bottom layer of a cake! 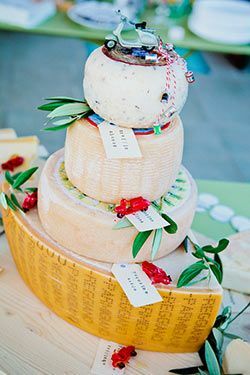 Some companies will offer a large wheel of brie or similar soft cheese as the base tier of a cake with various hard cheeses on top. This does not work for several reasons. First and foremost, soft cheese is named as such as it should be soft! Thus, if served as intended then the heavier cheeses on top will squash it and the cheese will be damaged. To solve this problem companies serve the cheese severely under ripe and hard, making it less than a pleasure to eat. 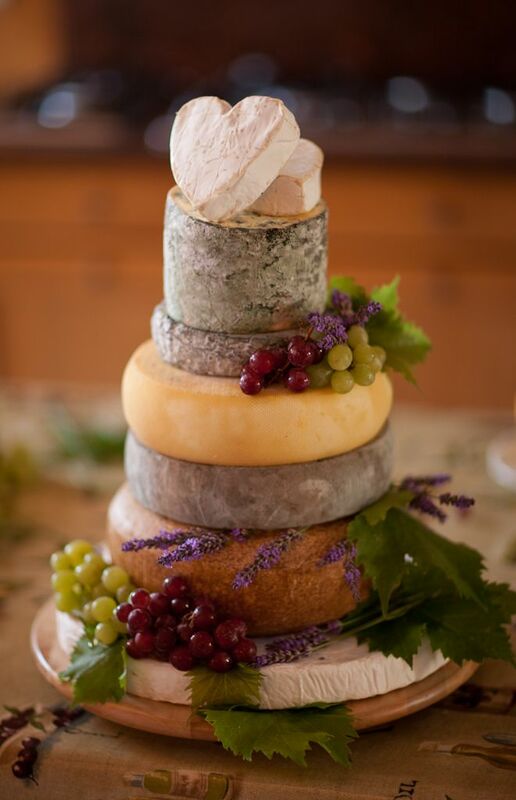 The bottom tier of the cake should be a hard cheese, depending on the size of the cake needed, a large wheel of cheddar like Montgomery's or Lincolnshire Poacher works very well, it is stable enough to support various other cheeses and a great crowd pleaser taste wise. Next should come another hard cheese, again depending on the size you may wish to have 2-3 layers of hard cheese before you move on to softer varieties. Cornish Yarg is a beautiful cheese to add to a cake due to its decorative rind of nettle leaves, it can be used as both a base and middle layer. Blue cheese is an essential element of any cake, there will always be some blue fans at any event! Colston Bassett Stilton is a firm favourite and classic British blue cheese, with a complex flavour, at first sweet and creamy giving way to a grassy tang. However, you could opt for a smaller slice of a softer blue such as Cashel or Crozier further up the cake, depending on the overall size. Soft cheese should appear only in the last 2-3 layers of a cake, here unlike before, one or two soft cheeses will sit comfortably atop of each other as the size and weight are minimal. A medium wheel of soft cheese such as Waterloo or Wigmore makes a good base for smaller soft cheeses, popular examples include Camembert, Tunworth and Oxford Isis. 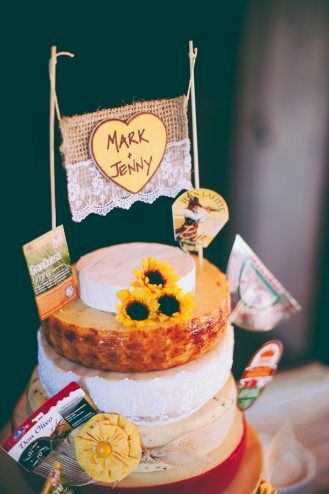 A cake is topped with a smaller, "pretty" cheese to finish it off. Goats' cheeses work well here as they tend to come as smaller whole cheeses with various coloured rinds and shapes. One of the most used cheeses for this purpose is the Petit Langres, a small, orange, washed rind cows milk cheese from the Champagne region of France. The cheese has a sunken top due to the fact it is not turned as it matures, traditionally champagne is pured in the dip (known as a 'fontaine' or 'curvette') and left to soak through before being enjoyed. 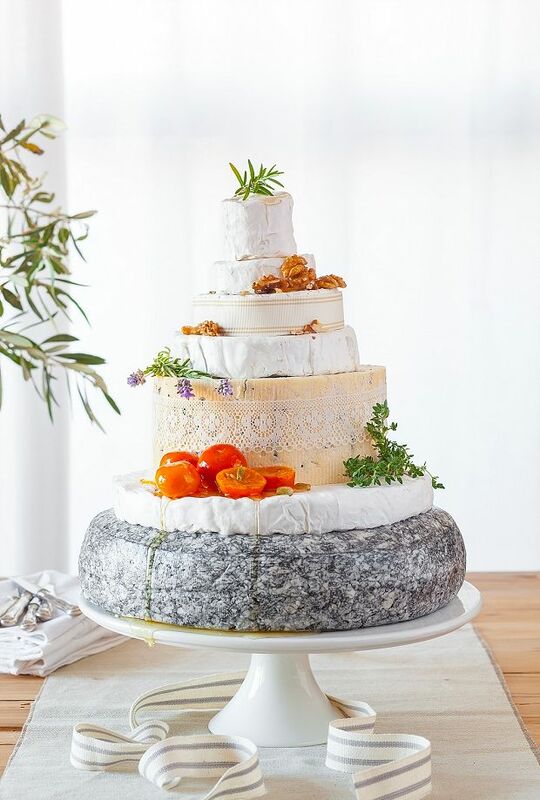 As the top cheese is small many couples choose to not offer it to their guests but keep it for themselves, as a delicious keepsake of their special day, to be enjoyed privately at a later time.